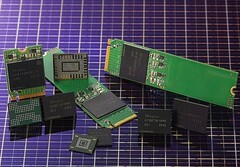 SK Hynix managed to beat Samsung and Toshiba once again in being the first one to unveil a flash memory product. This time, it is the world's first 96-layer 512 Gb 4D NAND flash chip. Mass production will start before the end of the year and the first products to use the new chips should show up in the first quarter of 2019. SK Hynix is back with a new NAND Flash chip that will enter the mass production stage before the end of the year. The new chip is the world's first 96-layer 512 Gb 4D NAND Flash, and it involves quite a few technologies: a 3D CTF (Charge Trap Flash) design paired with PUC (Peri Under Cell), as well as rather traditional TLC (Triple-Level Cell) arrays. In the future, the company expects to introduce 1 TB SSDs with Hynix controllers and UFS 3.0 solutions, as well as 96-layer 1 Tb TLC and QLC (Quad-Level Cell) chips. All these should arrive in 2019.